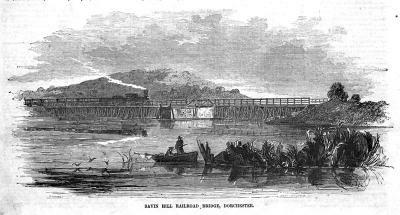 Savin Hill Railroad Bridge circa 1855: An engraving from Ballou's Pictorial Drawing-Room Companion shows a steam engine on a wooden trestle pulling a train across the waters of Dorchester Bay. The MBTA Red Line uses the same route today. In 1631, John Glover, one of Boston’s founder Puritans, set up a tannery close to what is today the intersection of Dorchester Avenue and Freeport Street. According to some historical authorities, this was the first tannery to be established in the Massachusetts Plantation. Over time, Glover prospered, his descendants stayed on, and the area grew into a village known as Glover’s Corner. It was a good location. In Glover’s time, Dorchester Bay came all the way up to what is now Dorchester Ave. From modern-day Freeport Street, the shoreline continued north for one-quarter of a mile, then circled around today’s Bay Street, then a marshy lot, to reach the base of Savin Hill at what is now Fox Point. The section along Freeport Street was deep enough to construct wharves that could service merchant ships. It has been said that Freeport Street got its name because the town of Dorchester was a “free” port, as opposed to Boston, which had its Customs House. In the undated antique postcard photograph, “A View of Dorchester Bay from Mt. Ida,” the masts of sailing ships are clearly visible above the rows of three-decker rooftops. A century ago, in her poem, “Meeting House Hill,” the cigar-toting poet Amy Lowell imagined sighting a tea clipper just back from China, tacking into Dorchester Bay with her hold full of green and blue porcelain. Any American Lit major will be able to explain how Lowell’s poem serves as a metaphor for the convergence of cultures. In 2016, the tannery site of the 1630s is at the center of another clash between the old and the new: Glover’s Corner is being proposed as the location for DOT Block, a large private real estate development, and the question is: What is on the horizon for Dorchester now? DOT Block will replace an industrial complex that has been vacant for decades. It is definitely a game changer in terms of scale. There is nothing like DOT Block on Dot Ave. – 364 units, all rentals ($2,100 a month for a one-bedroom unit). And it comes with a garage for 450 cars. This last fact is what usually hits home, and people begin to realize how much more crowded things could get. Most everybody I know welcomes development in the expectation that it will bring prosperity to Dorchester. There appears to be something for everybody as development spreads across the neighborhood: homeowners will see property values rise; the underemployed can hope to find job opportunities in building and staffing these new structures; and since private developers are required by law to include 13 percent affordable housing, for some lucky residents, this could be like hitting the lottery. Nevertheless, there is also talk about displacement, and claims that DOT Block is just the tip of a wedge. Across the street, within the limits of the so-called Freeport Street Corridor, there is enough room to build half a dozen more developments just like DOT Block. This is what worries the skeptics: If the introduction of several thousand new units, most of them going for luxury market rates, creates a domino effect that spreads out and flips neighborhoods one by one, then our community as we know it would disappear. Freeport Street follows the 1630 contours of Dorchester Bay. When the water proved to be too shallow to accommodate bigger ships of the modern era, the wharves north of Freeport Street were paved over and the marshland between the Bay Street and Dorchester Avenue was filled in. Much of this was done between 1910 and 1920, with more work later in connection with the creation of the Old Colony Parkway (now Morrissey Boulevard) in the 1920s. Even more was done later when the Southeast Expressway went through in the 1950s. Today this area is all landfill and flat as a pancake. Today’s maps show the streets of Dorchester packed tight with houses; by comparison, the Freeport Street Corridor has relatively few streets. Look west from the window of a subway car while travelling to and from the Savin Hill MBTA Station and you will see that the area is still a backwater. There are hundreds of school buses tucked away in a Freeport Street lot, and fleets of trucks and cars parked here and there; there is an electrical transformer, several one-story warehouses, a couple of cell towers, a sandpit, a tow yard, and auto body shops. Basically, it’s just an enormous collection area. For developers, the Freeport Street Corridor is spread out before them like a Christmas dinner. Because nobody lives there, it’s less likely that there will be any organized opposition. To be fair, it must be said that neighbors have been given the opportunity to voice their support and criticisms of any proposals for the area. But how can the average person hold his or her ground against private corporations that have the time and the resources to pay advocates to fight for them day after day, wearing down those of us who never expected to have to make choices like these? With less federal support available, cities and towns across the country have turned to the private sector to help finance expansion. Boston has been successful in attracting investors, even though there is fierce competition. But as the beggar in the bargain, a community risks losing as much as it expects to gain. The Freeport Street Corridor is a prime location, boasting ocean views and easy access to a major highway on the outskirts of a metropolitan city. Is this going to be the site of Boston’s next mega-development? Everybody needs to know what’s at stake here. The Boston Redevelopment Authority sits poker-faced while things are lurching forward in this part of the city’s largest neighborhood. Is there a master plan for the Freeport Street Corridor? If one were presented, it would raise the larger issues and we could have a Dorchester-wide discussion about what we want our neighborhoods to be. Not long ago, I spoke with a police officer who makes the rounds giving the latest police reports at civic meetings. He mentioned that he lived in South Boston, so I asked what that was like. He laughed and said that you wouldn’t recognize it from when he was a kid. I knew what he meant. Then I asked if he thought that the same thing could happen in Dorchester.